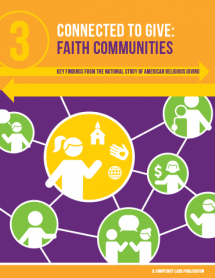 (Los Angeles, CA) The forthcoming report Connected to Give: Faith Communities demonstrates that most household giving goes to organizations with religious ties, whether to congregations or to religiously identified charitable organizations. The report offers an important new perspective on giving that highlights the multidimensional nature of religion and giving in America. Donations to religious congregations represent about 40 percent of household giving nationally. This is giving for primarily religious activity or spiritual development. In addition, there are many nonprofit organizations pursuing other purposes, from basic needs and health care to the environment and international aid, but which also have religious identities. Approximately one-third of household giving goes to these religiously identified nonprofits, including those linked to specific denominations or rooted in religious traditions, such as Catholic Charities, the Salvation Army, World Vision or Jewish federations. The new report finds that when giving to other charitable organizations that have religious identities is taken into account in addition to giving to congregations, nearly three-quarters of all U.S. household giving—73 percent—goes to organizations that have religious ties of some type. This groundbreaking study makes clear that religious influences are important to the giving decisions of Americans from a spectrum of religious traditions and spirituality. Landres is CEO and research director of Jumpstart, a philanthropic research and design lab, which collaborated with the Indiana University Lilly Family School of Philanthropy and GBA Strategies on the survey of 4,862 Americans households of various religious traditions. The report by Jumpstart and Lilly Family School of Philanthropy researchers provides breakdowns by age, household income, motivations, and purposes of giving across the five largest American religious groups—Black Protestant, Evangelical Protestant, Jewish, Mainline Protestant and Roman Catholic—as well as Americans not affiliated with a religious tradition. The report focuses on three dimensions that influence whether a person makes a gift to a specific organization: 1) the purpose of the organization, 2) the identity of the organization, specifically whether it does or does not have a religious identity and 3) donor orientation, that is, whether or not individuals consider themselves to be religious or spiritual. “Much of what has previously been thought of one-dimensionally as giving to ‘secular’ purposes actually goes to religiously identified organizations,” said report co-author Dr. Mark Ottoni-Wilhelm, professor of economics and philanthropic studies at the Lilly Family School of Philanthropy. Most Americans (80 percent) identify themselves as religious or spiritual. Among Americans who give, more than half (55 percent) say their commitment to religion is an important or very important motivation for charitable giving, the study found. Giving to religiously identified organizations plays a larger role in some subsectors than in others, the study found. For example, among people who give to organizations that meet basic human needs 66 percent do at least some of their giving to religiously identified basic needs organizations, but among people who give to environmental organizations, 42 percent do at least some of their giving to religiously identified environmental organizations. "In the current nonprofit environment, where national conversations rightly are focused on outcomes and impact, our findings are an important reminder that identities and values play a critical role in shaping charitable choices," said Dr. Jeffrey R. Solomon, president of the Andrea and Charles Bronfman Philanthropies and co-founder of Connected to Give. "Donors keep both in mind when they decide where to make their gifts," he added. While most dollars given go to organizations with religious ties, Americans give to organizations that are not religiously identified at a similar rate as they give to organizations with religious ties (congregations and religiously identified charitable organizations) — 53% and 55%, respectively. For most charitable purposes, donors make contributions to both religiously identified organizations and organizations that are not religiously identified, rather than only to one type or the other. Americans affiliated with different religious traditions give at similar rates to each other. Connected to Give: Faith Communities was written by Melanie A. McKitrick, Mark Ottoni-Wilhelm and Amir D. Hayat of the Indiana University Lilly Family School of Philanthropy and J. Shawn Landres of Jumpstart. Connected to Give—which so far has produced three reports with at least three more in the pipeline—is funded and led by a national collaborative consortium of more than a dozen independent, family and community foundations and organizations. New funders are continuing to join the effort; current partners include Andrea & Charles Bronfman Philanthropies, Max M. & Marjorie S. Fisher Foundation, Emanuel J. Friedman Philanthropies, Harold Grinspoon Foundation, Jewish Community Foundation of San Diego/Leichtag Family Foundation Partnership, Koret Foundation, Lippman Kanfer Family Foundation, Marcus Foundation, Joseph Meyerhoff and Rebecca Meyerhoff Awards Committee, Jack and Goldie Wolfe Miller Fund, The Morningstar Foundation, The Natan Fund, Rose Community Foundation (Denver), Jewish Community Federation of San Francisco, the Peninsula, Marin and Sonoma Counties, Charles and Lynn Schusterman Family Foundation, and Birthright Israel NEXT. Additional support was provided by Mandell Berman. Connected to Give: Faith Communities will be available for download at http://www.connectedtogive.org. “Like” Connected to Give on Facebook. Connected to Give: Faith Communities will also be the centerpiece of the Faith+GivingTuesday+SocialGood Summit on Tuesday, December 3, to be convened in Los Angeles, CA by Jumpstart. Philanthropic, nonprofit, and religious leaders will explore the implications of the report and broader questions about religion and giving. Currently scheduled for 1:00 – 4:00 p.m. PST at the USC Caruso Catholic Center, it also is expected to be livestreamed. Media credentials are available via the contact above. Jumpstart is a 501(c)(3) philanthropic research & design lab based in Los Angeles. Jumpstart’s unique combination of research, convenings, and funding enables creative changemakers—philanthropists and institutional leaders alike—to realize their own visions and advance the common good. Jumpstart’s innovative approach to analysis and forecasting, through such publications as The Innovation Ecosystem and The Jewish Innovation Economy, has earned international recognition. For further information, please visit http://jumpstartlabs.org or email connect@jumpstartlabs.org. Follow us on Twitter or “Like” us on Facebook. Indiana University Lilly Family School of Philanthropy is dedicated to improving philanthropy to improve the world by training and empowering students and professionals to be innovators and leaders who create positive and lasting change. The school offers a comprehensive approach to philanthropy through its academic, research and international programs and through The Fund Raising School, Lake Institute on Faith & Giving, and the Women’s Philanthropy Institute. Follow us on Twitter or “Like” us on Facebook. Visit the Connected to Give website to view and download the report.